Okay, after kind of a rough week at work, here's a YouTube "Honest Trailer" that I've been laughing at. It's a couple of years old, corresponding with the release of Warlords, but it is still accurate. I'd been channeling my inner Leia when I first saw the trailer for Warcraft: The Beginning. "I have a bad feeling about this" was my mantra whenever it would pop up on my blogger list as well as my Facebook feed. I remember how I really really wanted the Dungeons and Dragons movie* to succeed, but all it really did was become a punchline on how stupid the game must be to create a movie this bad. The mini-Reds would laugh at the occasional D&D Movie snippet that they'd find on YouTube, from Jeremy Irons' dreadful overacting to the actual use of the D&D metaterm "low level" in a description of a Mage in the movie. The worst thing that could happen? That you'd be required to perform research in order to understand and enjoy Warcraft: The Beginning. What I didn't expect was to have a reviewer compare Warcraft not so favorably to the John Travolta adaptation of L. Ron Hubbard's SF pulp story Battlefield Earth. The reviews aren't looking so good at the moment, with Rotten Tomatoes' Tomatometer sitting at 33% positive critical reviews. And that doesn't even include the bad review that Kotaku published. The commentary that I've been reading isn't exactly helping matters. When you've got fans hollering about how people should have done their research or played the game in order to appreciate the movie, that's not a good thing. That's the equivalent of telling fans of the Marvel Cinematic Universe that they should have read all of the backstory in the comics before they went to go see Captain America: Civil War. 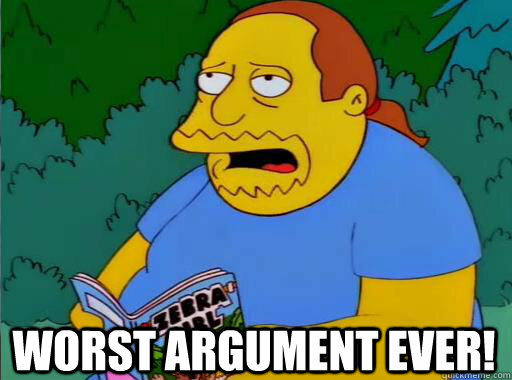 Gee, thanks, Comic Book Guy. Things might change once more reviews are released, but right now it's not looking good for the Warcraft franchise. Will I see the film in the theater? Not likely, as I rarely go to see movies in the theater***, but that doesn't mean that I won't hope for a decent turnout. But at the same time, the movie has to earn the turnout by being a good film that is accessible to the general public, and I'm not sure that Warcraft: The Beginning has what it takes. *It it was at all possible, there were two sequels to the D&D movie. One went straight to the (then) Sci-Fi Channel, called Curse of the Dragon God, and the other... Let's just say that the other one --The Book of Vile Darkness-- is so bad that while it is listed in IMDB as a "TV Movie" I never saw it released onto television at all. If it did, I'd say it escaped more than was released. **Even then, there were plenty of people who couldn't follow the details in the movie, but still liked it for the spectacle. And that was for an Academy Award winning trilogy. The problem with The Hobbit? Peter didn't follow the world building pace that he did in LOTR. Sure, a lot of the stuff was found in the LOTR Appendices, but it wasn't necessary to expand The Hobbit into three full movies. Google has gotten around to enabling https connections to PC and other Blogger sites. Therefore, if you want a secure connection, you can use https://parallelcontext.blogspot.com instead of the traditional http connection. Carry on, good people, and Happy Friday!! He drew a deep breath. "Well, I'm back," he said. Last week I finally finished the original Epic campaign in LOTRO, the Shadows of Angmar. It's been a while, probably since the original time through the SWTOR Smuggler story, that I've been reduced to sitting and looking at the screen, saying, "Wow." I'd also quipped to the oldest mini-Red that while this was supposed to take place prior to the Fellowship leaving Rivendell, you can tell that this was designed for "MMO Middle-earth", as there'd be no way a player could get back and forth from Ered Luin to Rivendell to Angmar to Forochel in anything resembling a "short" 2-3 month time span. But that's fine. You can't expect a game to maintain it's dramatic tension by adhering religiously to the full scope of Tolkien's creation. "Moving at the speed of plot" is the watchword here. What stood out the most to me about Shadows of Angmar was that the LOTRO development team wasn't afraid to make one of the big baddies a woman, and a clever, cunning, yet complex woman at that. It is something that you'd not see in Tolkien's work itself, outside of perhaps Ungoliant or Shelob, but in a game designed for the 21st Century it worked very well. I can see the Tolkien purists not liking the Shadows of Angmar epic questline, but then again I can also see them disliking LOTRO itself in the same way that they dislike the LotR movies: if it doesn't religiously adhere to the books, then it must not be worth playing/watching. What I do believe, however, is that you can remain faithful to the source material while expanding upon it. The devs made logical conclusions based on the source material, and that enhance the overall MMO experience. Even when the source material indicated some things, such as the Dunedain of the North maintaining some settlements in The Angle** after the fall of Arthedain, that didn't detract from the story driven placement of the hidden Ranger encampment of Esteldin in the North Downs. The funny thing is, even with some revisions to zones such as the Trollshaws, LOTRO is still decidedly an Old School style MMO. The Epic questline takes you back and forth across Eriador in a way that is simply not done in WoW these days. While such trooping back and forth isn't realistic due to the timeline involved, it does provide an epic scope to the story. Another thing that made my leveling easier was my familiarity with MMO tropes. While the mini-Reds will do their own thing and collect quests here and there, I'm so used to MMO-style quest collection*** that I just leveled very quickly without intending to. I'd not exactly say I power leveled, because to me power leveling is something that takes you from L1 through L50 in a week or two, but the mini-Reds kept remarking on how quickly I shot up to the low 50s. "When seven years playing MMOs you reach, leveling as fast you will" was my reply. I also had the benefit of them having used my account for their initial forays into LOTRO, so they'd unlocked some areas --such as Forochel and Angmar-- without me needing to use my steady collection of Turbine Points to keep moving forward. But for me the biggest boon was that they unlocked the gold cap, which helped me out a LOT. Especially when I finally had to dip my toe into the auction house to buy a weapon, as my (then) current weapon was woefully inadequate for the zones I was in. When the Epic storyline is complete, you really have a sense of accomplishment. It may not be THE epic storyline of Middle-earth at the end of the Third Age, but you can be satisfied that you struck a blow against the Shadow in the North. But the best part? You didn't need to raid to complete the story. Sure, you can raid, but it's not the necessary to finish the Shadows of Angmar. I can see where this is the genesis of SWTOR's idea for the original class story to be completely separate --and designed for solo play-- away from the rest of the SWTOR stories. Sure, you can get a fellowship to help, but if you play it smart you can solo the Epic questline courtesy of the Inspiration buff. And go back to SWTOR, too, I suppose. *Well, to me they were obvious. **Just south of Rivendell. It's location would be ideal to have the protection of the House of Elrond without drawing attention to itself. ***You know, the type that focuses on a single area from a quest hub and then you move onto the next quest hub. LOTRO isn't so neat and clean in that regard, but compartmentalizing the story by focusing on a single quest hub at a time speeds things up considerably. Besides, why would you want to kill all those bears twice?? I realize that as gamers, it's easy to focus on games or the entertainment world to such an extent that the real world is some other place way on the other side of the galaxy. * But there are times when the real world intrudes and you have to pay attention. This past week has been one of those times. I know this has gotten airplay as far away as Deutche Welle and NHK (Japan), but there are people who still haven't heard of the wildfires in Alberta, Canada. 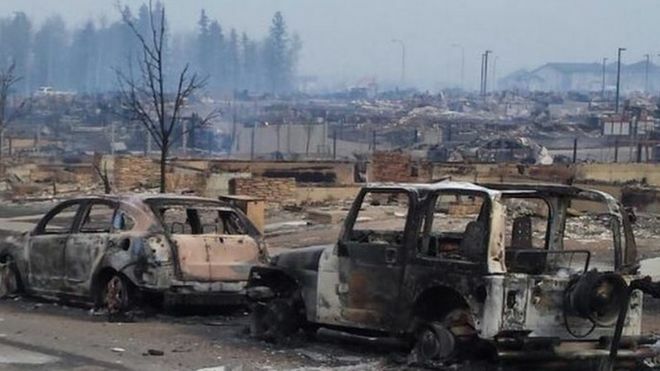 The wildfires, fed by a perfect storm of weather conditions, forced the evacuation of the entire city of Fort McMurray (80,000+ people). While the latest reports said that most of the city was saved, there has been a high personal cost. Fellow MMO blogger and Blizzard Watch columnist Stacey Landry, who uses the name Vidyala on her blog Manalicious and webcomic From Draenor With Love, has family personally affected by the fire. Her brother, Matt Landry, and her sister-in-law, Aileen, lost their home to the fire. To help her brother and sister-in-law get back on their feet, Stacey has created a GoFundMe campaign to provide some assistance. If you can, please help by visiting the site and helping to spread the word. *Or ocean. But still reachable by flightpath. When you have a Facebook group promoting your WoW "legacy server", like Nostralius has, you're not exactly hiding in plain sight*. So, while it isn't exactly a surprise that Blizz eventually told Nostralius to shut it down, I am surprised at the latest news from the Nostralius front: the Nostralius team is scheduling a meeting with Blizzard at the Blizzard campus. I can't imagine much coming out of the meeting, as Blizzard really holds all the cards here, but if this meeting does come out at least it gives them the opportunity to give the appearance of concern for what I'm going to dub the legacy community. I suppose I could call the pirates, or snobs, or whatever, but the reasons for wanting to play on a legacy server are likely as varied as reasons for playing on any MMO. Well, outside of the "fun" part. I can't imagine anyone continuing to play for very long if they're not having fun. I'm in front of the Hobbit. 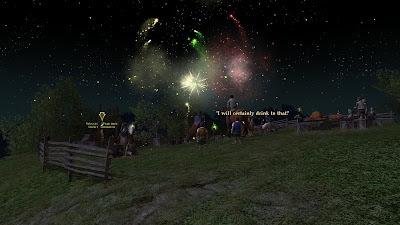 Some fireworks from the LOTRO 9th Anniversary event. *I realize not everybody has a FB account, but if you don't you'll have to trust me that it really does exist.